The Bold Bagel: Art History Analysis: "Love Is The Drug"
In the image, “Love Is The Drug”, by Richard Mosse, two different views are encompassed. 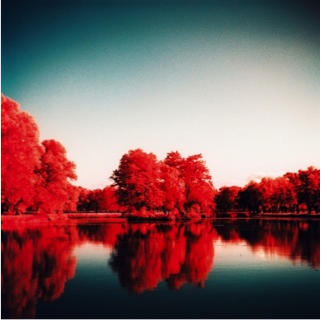 One is of a beautiful, surreal place covered in gorgeous red flowers cut by a glistening green-blue river. The other is of a sinister landscape covered in what looks like blood running down the hills, cold, yet mesmerizing scene. Whichever a viewer sees when they look at this photograph, or even something entirely different, it strikes at something in their mind. They ask themselves, where is this place? Is it real? What is happening here? This is exactly what Richard Mosse wanted his viewers to think about when they saw his work. In his body of work, specifically “Love Is The Drug”, Richard Mosse alters two wrongs to make a right. He uses the war-ridden Congo as his landscape and uses color infrared technology as his medium to create a beautiful place, so that he can construct an ethical conflict in his viewer’s minds, in order to raise awareness about the Congo war. NC Museum of Art. Love Is The Drug. Digital image. N.p., n.d. Web. Richard Mosse originally went to the Congo for very far-fetched reasons. He had recently discovered color infrared technology before he began his work in 2012 (Latella), and wanted a place to test out this type of film. He was fascinated by it’s original ability to make the unseen, seen, which contributed to him picking the Congo as a place to test out his new gadget. The Congo had been struggling with war since 1998, and had amassed over 5.4 million deaths since then, yet not many people knew about this war (“Jack Shainman”). Richard Mosse decided that he wanted to take two things, one that discovered unhidden things, and something that was hidden, and put them together to see what he could create. Richard Mosse discovered color infrared film in 2009, and learned later that year that Kodak would be discontinuing the Aerochrome camera that used the film. Color infrared film was originally created by the U.S. military as a tool to find camouflaged enemy soldiers by turning their surroundings pink. The film does this by reflecting off the chlorophyll in the plants and any other green color around it (Frieze). The use of color infrared film was high in the 1940s, especially during World War II (“New Republic”). After that, the film was only used occasionally by the military until Richard Mosse re-discovered it. Mosse decided that he wanted to take this unknown film that was used for potentially only bad things, and he wanted to re-introduce it to the world in his photographs. Test picture of one of the filters on the Kodak Aerochrome. Richard Mosse came to the Congo almost 15 years after the conflict started. The conflict began long before 1997 though. There was a First Congo War that was dying down in 1996, when rebel groups began popping up in several countries around the Congo. Many of the countries around the Congo didn’t agree with the leadership change after the first Congo War, and then went on to make it an ethical issue between the Tutsi and Hutu groups (Reyntjens). Countries on one side of the Congo were part of one ethnic group and countries on the other side were part of the other. The countries disagreed so much about the changes that were being made after the war that “the Tursi of North Kivu [became] victims of pogroms and some degree of ethnic cleansing” (Reyntjens). As the tensions continued, the issues from the first war appeared again, in a more severe manner. The Congo didn’t really have a place in the conflict, it was just a middle ground between the feuding countries. The Congo got sucked into the war like a child between two divorced parents and is still stuck there today. Richard Mosse. "Passion of Lovers". 2012. As Richard Mosse pointed out, he and many other areas of the world didn’t know much about the Congo war. He also had a type of film that he and most of the world wasn’t familiar with either. As he said in his interview, “I was fascinated to bring this film which registers the invisible, makes visible, the unseeable, to bring that to a place which was also [this way]--[which] was a metaphoric leap of, course--but, in my mind it was a way of bringing these two things together and to just see what would happen,” which is exactly what he did and in the process he raised awareness for the Congo through his project The Enclave (Frieze). One of the galleries The Enclave was shown in. A piece that he captured and captioned, “Love Is The Drug”, is an interesting part of the series, that raises many questions. The picture almost seems out of place in his series, which mostly depicts soldiers, people in landscapes, war scenes, and death scenes. “Love Is The Drug” is of a serene landscape, a place that someone could look at and see beauty even without the color infrared lens. With the vague caption and just the landscape, Richard Mosse leaves the interpretation of the piece wide open for his viewers. If someone were to see this photograph without the series (as they would in the NC Museum of Art), and if they didn’t read blurb about the photograph next to it, they may come up with something about “loving our land”, such as a global warming/save our planet picture. Someone who is informed about the place where the photograph was taken and the situation there would come to a very different conclusion. One of the conclusions a viewer could come to is the “sinister landscape option”. They would think that this beautiful, undisturbed place has been tainted with war, and that the red covering the hills is the blood of the 5.4 million people who have died. Viewers could believe that the Congo was an innocent country spilling innocent blood because they were the middle ground between the warring countries on either side. They may also believe that the Congo itself has become a tainted place because it has participated in this awful war, and that the red color infrared lens is what the land truly looks like because of the war. Another conclusion a viewer could have is the complete opposite. They could see at “beautiful, surreal landscape,” that looks as if it isn’t even real. They could interpret the title and the coloring as what the land would look like if the war ended, and people came together. “Love Is The Drug” could mean that love is the only thing that can bring this war to an end; “drug” could be painted in a positive connotation as a “cure” to stop the death and fighting around them. Whichever conclusion the reader picks, it creates an ethical conflict in the reader’s mind, which is exactly what Richard Mosse intended to do. Whether they are thinking about an innocent land that has been tainted by war, or a land that is in the midst of war and can only be saved by love, the viewer is mentally chewing on the work, trying to figure out a way to make the matter sit correctly in their mind. Richard Mosse does this with all his other pictures in The Enclave as well, from depicting child soldiers carrying guns to massacres in a bright pink land. By creating this ethical problem or conflict in his viewer’s mind, he is raising awareness and drawing attention to a situation that otherwise might have never surfaced from the African people and and other countries’ officials. He is unveiling the war for the common people of other countries to see, so they can see what would have otherwise been hidden to them. Overall, Richard Mosse originally had a far-fetched dream that ended up turning into a huge success. He was able to use color infrared film technology and the 15-year-long Second Congo War to create a beautiful, yet disturbing series of pictures. With the creation of these images in The Enclave and most notably in “Love Is The Drug”, Richard Mosse was able to spark ethical conflicts in all his viewers’ minds, which has in part, raised awareness on the situation in the Congo. Frieze. "Richard Mosse: The Impossible Image." Vimeo. N.p., Apr. 2014. Web. <https://vimeo.com/67115692>. Jack Shainman Gallery. 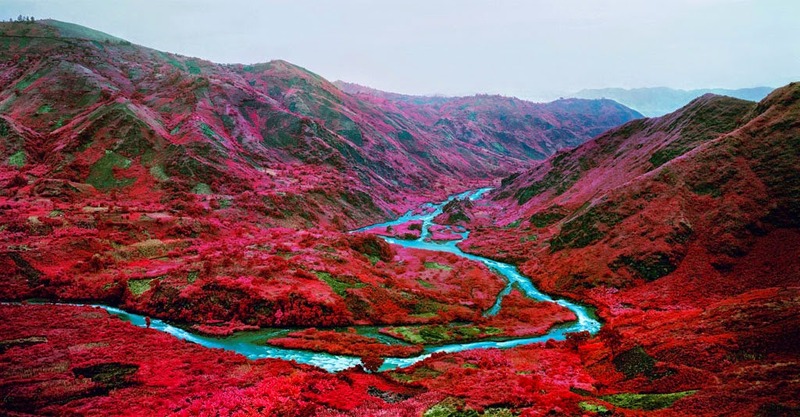 "Richard Mosse: the Enclave." Jack Shainman Gallery. N.p., 22 Feb. 2014. Web. 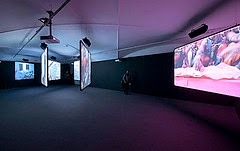 <http://www.jackshainman.com/exhibitions/past/2014/richard-mosse/>. Latella, Leah. "Richard Mosse Rethinks War Photography." ABC News. N.p., 5 June 2013. Web. 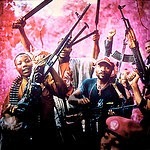 <http://abcnews.go.com/blogs/headlines/2013/06/images-richard-mosse-rethinks-war-photography/>. New Republic. "Heartbreaking, Stunning Infrared Photography from the Congo." New Republic. N.p., 23 July 2013. Web. <http://www.newrepublic.com/article/113876/richard-mosses-infrared-congo-photography-enclave>. Reyntjens, Filip. "Briefing: the Second Congo War: More than a Remake." African Affairs 98.391 (1999): 241-250. Web. <http://www.jstor.org.prox.lib.ncsu.edu/stable/723629?pq-origsite=summon&seq=2#page_scan_tab_contents>.